CHICAGO, IL--(Marketwire - March 14, 2008) - Richard Lee, MD, cardiac surgeon and surgical director for the Center of Atrial Fibrillation at the Bluhm Cardiovascular Institute of Northwestern Memorial Hospital is pioneering the Hybrid Maze procedure, a minimally invasive surgery for patients with atrial fibrillation. 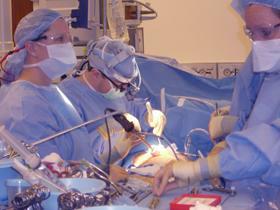 On Wednesday, April 9th, 2008 on www.OR-Live.com, you can see a live panel discussion regarding the Hybrid Maze procedure performed at Northwestern Memorial Hospital. Dr. Lee and Patrick McCarthy, MD, co-director of the Bluhm Cardiovascular Institute and the chief of the division of cardiothoracic surgery at Northwestern Memorial Hospital, will host this interactive discussion and describe the surgery with taped footage of a Hybrid Maze procedure. The doctors will answer live email questions from the Internet during the live webcast. The Hybrid Maze is performed in two stages. Stage I, minimally invasive surgery and Stage II, minimally invasive catheter ablation. Each procedure is responsible for placing scar lines in very specific places in and around the heart to isolate abnormal electrical signals that cause atrial fibrillation. Stage I places scar lines around the pulmonary veins from the outside of the heart with energy sources such as radiofrequency, cryo, laser, ultrasound, and microwave. Stage II, catheter ablation, places scar lines in the upper chambers or atria of the heart from the inside of the heart with energy sources similar to those used in Stage I. After Stage I, the patient returns home and is monitored for approximately one month to see if the atrial fibrillation returns. Stage I can be up to 90 percent effective for certain types of atrial fibrillation. Patients with other types of atrial fibrillation may require Stage II. Abnormal electrical signals around the pulmonary veins and in the heart are thought to cause atrial fibrillation. During Stage I of the Hybrid Maze, small incisions are made on the sides of the chest to access and place scar lines around the pulmonary veins. The scar lines, made via an energy source, isolate abnormal electrical signals that cause atrial fibrillation. Traditional cardiac surgeries require a large incision that divides the sternum (breastbone), allowing the cardiac surgeon access to the heart. For stage I, a large chest incision is not necessary because a tiny camera, inserted through one of the small incisions, gives the cardiac surgeon a clear view of the pulmonary veins. Once the pulmonary veins are identified, surgeons use special instruments, which surround and create scar lines around the pulmonary veins. What makes Stage I a minimally invasive surgical innovation is that the procedure is performed on the beating heart through small incisions. Minimally invasive procedures allow for a faster recovery, shorter length of stay in the hospital, lower infection rates, and less bleeding and trauma than traditional cardiac surgery. For Stage II, patients undergo catheter ablation in the Electrophysiology Laboratory by specially trained cardiologists called electrophysiologists. Jeffrey J. Goldberger, MD, director of Cardiac Electrophysiology and medical director of the Center for Atrial Fibrillation, has vast experience with and has conducted extensive research in atrial fibrillation and catheter ablation. Catheter ablation is a non-surgical, minimally invasive treatment option for atrial fibrillation that involves inserting several catheters (tubes) into the heart and locating the abnormal electrical signals causing the atrial fibrillation. Once found, the pathway is destroyed with energy sources similar to those used in Stage I of the Hybrid Maze. Stage II targets areas of the heart that cannot be reached from the outside of the heart. "It is through the strength of each procedure and a multidisciplinary team of outstanding clinicians that we offer a two-tiered approach to our patients diagnosed with atrial fibrillation," states Dr. Goldberger. "The electrophysiologists and cardiac surgeons at the Bluhm Cardiovascular Institute spend time getting to know each patient and understand the specific characteristics of their atrial fibrillation. Once we understand the patient's atrial fibrillation, the team offers the therapies and procedures that we feel will best help the patient lead a life that is free from atrial fibrillation." Visit: http://www.or-live.com/NMH/2256 now to learn more and view a program preview.